Xamarin.Forms custom user interface controls should derive from the View class, which is used to place layouts and controls on the screen. 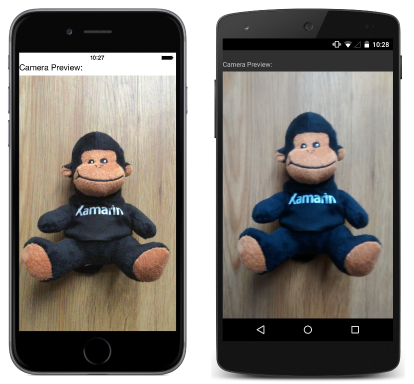 This article demonstrates how to create a custom renderer for a Xamarin.Forms custom control that's used to display a preview video stream from the device's camera. Every Xamarin.Forms view has an accompanying renderer for each platform that creates an instance of a native control. When a View is rendered by a Xamarin.Forms application in iOS, the ViewRenderer class is instantiated, which in turn instantiates a native UIView control. On the Android platform, the ViewRenderer class instantiates a native View control. On the Universal Windows Platform (UWP), the ViewRenderer class instantiates a native FrameworkElement control. For more information about the renderer and native control classes that Xamarin.Forms controls map to, see Renderer Base Classes and Native Controls. Each item will now be discussed in turn, to implement a CameraPreview renderer that displays a preview video stream from the device's camera. Tapping on the video stream will stop and start it. The CameraPreview custom control is created in the .NET Standard library project and defines the API for the control. The custom control exposes a Camera property that's used for controlling whether the video stream should be displayed from the front or rear camera on the device. If a value isn't specified for the Camera property when the control is created, it defaults to specifying the rear camera. An instance of the CameraPreview custom control will be used to display the preview video stream from the device's camera. Aside from optionally specifying a value for the Camera property, customization of the control will be carried out in the custom renderer. A custom renderer can now be added to each application project to create platform-specific camera preview controls. Create a subclass of the ViewRenderer<T1,T2> class that renders the custom control. The first type argument should be the custom control the renderer is for, in this case CameraPreview. The second type argument should be the native control that will implement the custom control. Override the OnElementChanged method that renders the custom control and write logic to customize it. This method is called when the corresponding Xamarin.Forms control is created. The ViewRenderer class exposes the OnElementChanged method, which is called when the Xamarin.Forms custom control is created to render the corresponding native control. This method takes an ElementChangedEventArgs parameter that contains OldElement and NewElement properties. These properties represent the Xamarin.Forms element that the renderer was attached to, and the Xamarin.Forms element that the renderer is attached to, respectively. In the sample application, the OldElement property will be null and the NewElement property will contain a reference to the CameraPreview instance. An overridden version of the OnElementChanged method, in each platform-specific renderer class, is the place to perform the native control instantiation and customization. The SetNativeControl method should be used to instantiate the native control, and this method will also assign the control reference to the Control property. In addition, a reference to the Xamarin.Forms control that's being rendered can be obtained through the Element property. A new native control should only be instantiated once, when the Control property is null. The control should only be configured and event handlers subscribed to when the custom renderer is attached to a new Xamarin.Forms element. Similarly, any event handlers that were subscribed to should only be unsubscribed from when the element that the renderer is attached to changes. Adopting this approach will help to create a performant custom renderer that doesn't suffer from memory leaks. Provided that the Control property is null, the SetNativeControl method is called to instantiate a new UICameraPreview control and to assign a reference to it to the Control property. The UICameraPreview control is a platform-specific custom control that uses the AVCapture APIs to provide the preview stream from the camera. It exposes a Tapped event that's handled by the OnCameraPreviewTapped method to stop and start the video preview when it's tapped. The Tapped event is subscribed to when the custom renderer is attached to a new Xamarin.Forms element, and unsubscribed from only when the element the renderer is attached to changes. Provided that the Control property is null, the SetNativeControl method is called to instantiate a new CameraPreview control and assign a reference to it to the Control property. The CameraPreview control is a platform-specific custom control that uses the Camera API to provide the preview stream from the camera. The CameraPreview control is then configured, provided that the custom renderer is attached to a new Xamarin.Forms element. This configuration involves creating a new native Camera object to access a particular hardware camera, and registering an event handler to process the Click event. In turn this handler will stop and start the video preview when it's tapped. The Click event is unsubscribed from if the Xamarin.Forms element the renderer is attached to changes. Provided that the Control property is null, a new CaptureElement is instantiated and the SetupCamera method is called, which uses the MediaCapture API to provide the preview stream from the camera. The SetNativeControl method is then called to assign a reference to the CaptureElement instance to the Control property. The CaptureElement control exposes a Tapped event that's handled by the OnCameraPreviewTapped method to stop and start the video preview when it's tapped. The Tapped event is subscribed to when the custom renderer is attached to a new Xamarin.Forms element, and unsubscribed from only when the element the renderer is attached to changes. It's important to stop and dispose of the objects that provide access to the camera in a UWP application. Failure to do so can interfere with other applications that attempt to access the device's camera. For more information, see Display the camera preview. This article has demonstrated how to create a custom renderer for a Xamarin.Forms custom control that's used to display a preview video stream from the device's camera. Xamarin.Forms custom user interface controls should derive from the View class, which is used to place layouts and controls on the screen.